This post was originally posted on the University of Oregon’s Biology and the Built Environment (BioBE) Center’s blog, here. I’m reposting here, with slight modifications. Enjoy! In July, I went to the annual Mycological Society of America (MSA) meeting, held just outside of Atlanta, Georgia, in the college town of Athens. 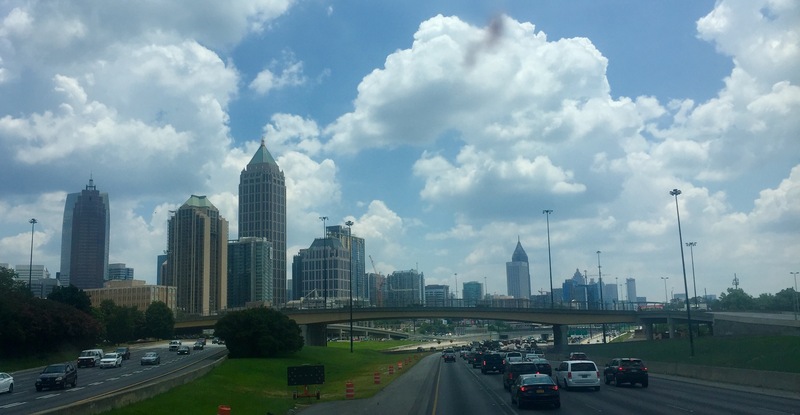 He went to learn what others in the field are up to, and present work from the BioBE Center. Roo live-tweeted most of the talks he went to; you can find him @MycoRoo on twitter to look back through his experience of the conference, and look up the hashtag #MSA17 or #MSA2017 to see other posts about the conference. Xylaria apiculata Cooke, from Reserva Los Cedros, Ecuador. Given the paucity of functional illustrations of this taxon, I wanted to create one of my own. This was the first Xylaria that I figured, back in 2012. While my illustration technique has certainly improved, I still remain proud of the functional beauty of this illustration. (scale bars: a = 2 mm; b = 1 mm (including stromatal section); c = 10 µm; d = 50 µm). I’m a mycologist. This is part of my identity. It’s a part that I’ve chosen, but one that it would be hard for me to give up, at this point. 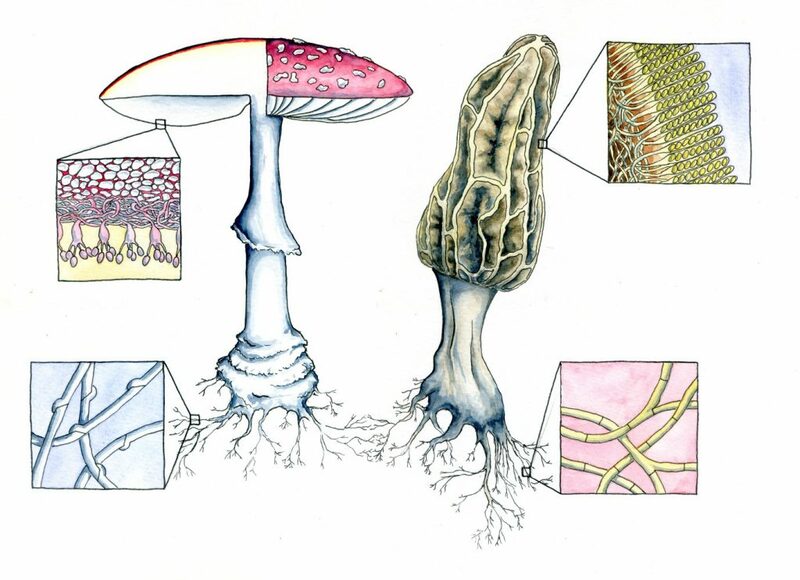 Why am I a mycologist? What brought me to the love of fungi? I think a lot of it has to do with an interested in the peculiar and the odd, and some deep-seated need to root for the underdog. I like fungi because they’re under-studied, poorly comprehended, misunderstood, and misrepresented. I identify with that; I feel a kinship with fungi because I feel like there’s something in common between myself and them, in a way. As some of you know, I’ve been working at the Biology and the Built Environment Center at the University of Oregon for the last few months as a microbial ecologist. The first project with them has come to fruition: a review of the concept of hygiene as it relates to human-associated microbial ecology. I blogged about that at MicroBE.net (you can read that post here, which includes a link to the BioRxiv preprint of the full review article). Today, I’d like to discuss a bit of history that only made it into the Review briefly, but I think is absolutely fascinating. It turns out, you can trace hand hygiene back to a discrete starting point in the middle of the 19th century. In Boston, Oliver Wendell Holmes, Sr. — now more famous as one of the Fireside Poets, along with Longfellow, but renowned as a physician in his own time — noticed the contagious nature of puerperal fever, which affects women shortly after childbirth. He published his findings in 1843 (though it went largely unnoticed until reprinted in longer form as a book in 1855), arguing that physicians with unwashed hands spread the disease. Holmes’s views were ridiculed by the established obstetricians of the time, but laid the foundations for thought about hygiene and the spread of infection in the American medical establishment. 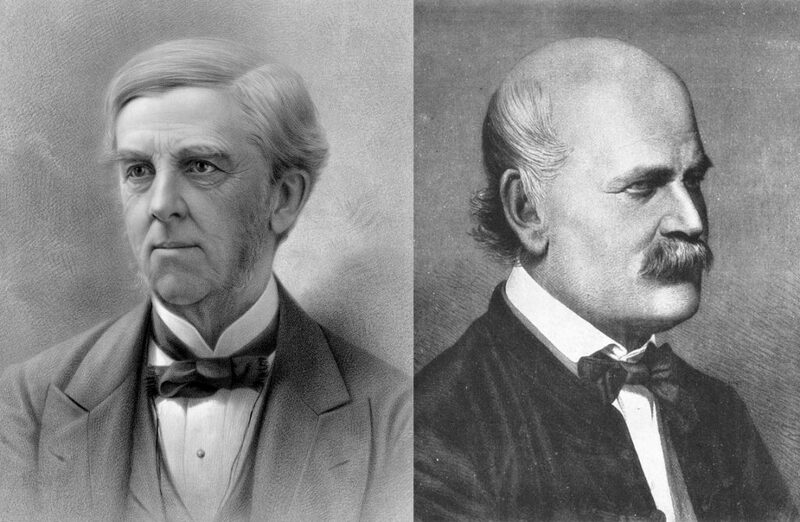 Oliver Wendell Holmes, Sr., on the left, and Ignaz Philipp Semmelweis on the right. Images shamelessly taken from their wikipedia pages. I’d like us to all think for a little bit about the way that we apply names to organisms around us. 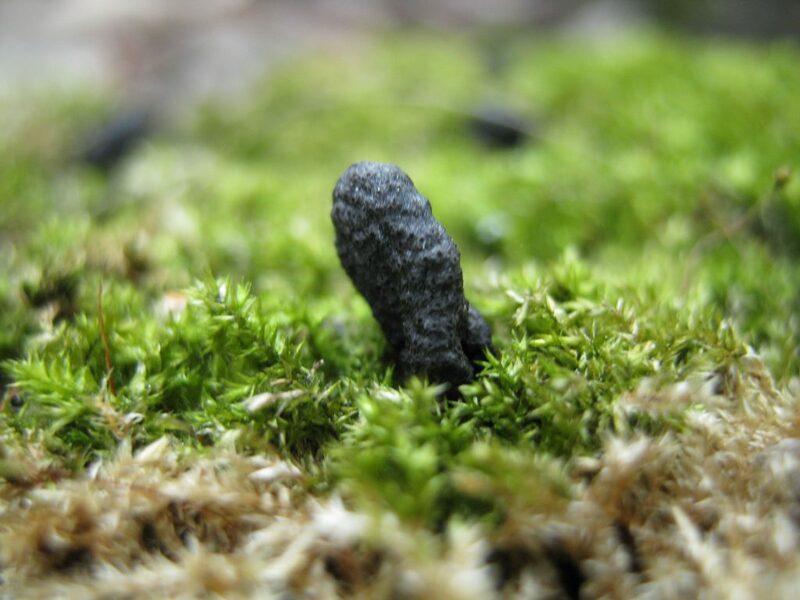 I started thinking about this after my friend Danny Newman hijacked the comments thread on this Mushroom Observer post of a Xylaria from Portugal. This post, but the amicable and cryptically-named zaca, was of a cute little Xylaria growing on a mossy log in a park in Lisbon. 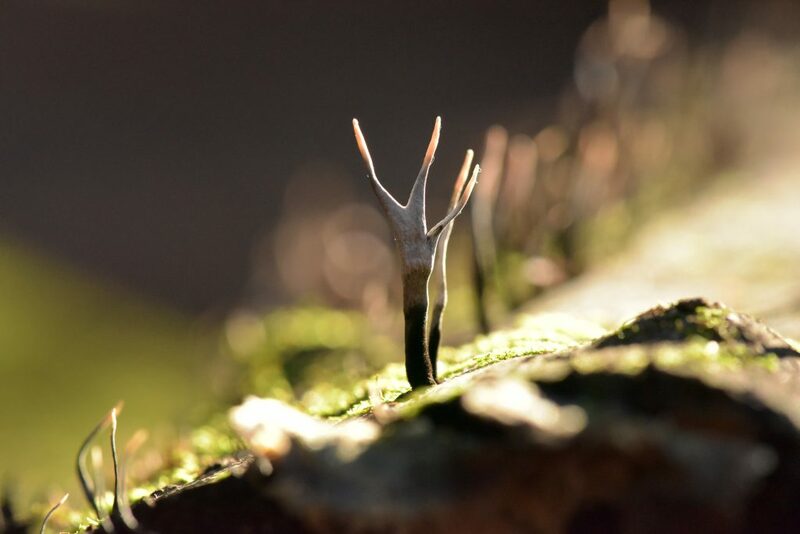 They’d tagged the find as “Xylaria polymorpha“, one of the two names for species of Xylaria often included in field guides; the other, of course, is “Xylaria hypoxylon“. Danny used the application of this widely misapplied name in such circumstances to start a more general conversation about how we apply names to fungi. I’d encourage you all to go read that comment thread, if you haven’t already. Xylaria cf. cinerea, photographed by zaca. Following up on my last post, this was prepared as a sample section from the children’s educational book about fungi that I’m starting to put together. I’m hoping to post more stories like this, and updates on the illustrations, content, and organization as it comes together. Hope you like it! When next you are out-of-doors, look up into the sky. That sky is but a skin of air, a few miles thick, floating over the whole surface of the Earth. It’s made up of many things, all mixed together — one very important part of the air is its carbon (in the form of carbon dioxide), which is the primary stuff out of which all life is made. 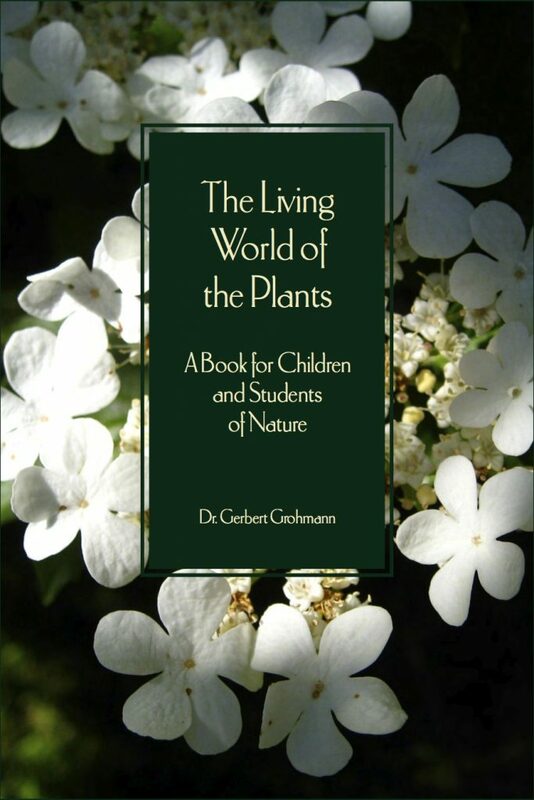 I recently came across a book for school-age kids, recommended for fifth graders (10–11 year olds), called The Living World of the Plants: A Book for Children and Students of Nature, by Dr. Gerbert Grohmann. Doctor Grohmann (1897-1957) was influential in the early days of the Waldorf educational system, and wrote a treatise on biodynamic farming, among other things. First translated into English in 1967 (translated from the German — I believe the original edition was Kleine Pflanzenkunde für Kinder, published in 1939, but it is hard to track down), this book has been reprinted many times (the one I have is from the year 1999), and is still used as a resource for teaching botany to 5th graders in some Waldorf schools, as well as being popular amongst homeschoolers. Last month, the Cascade Mycological Society asked me to do an educational piece of art for a fungi-themed show they were were organizing. I decided that I wanted to clearly illustrate some of the differences between Basidiomycota and Ascomycota, particularly with regards to reproductive structures. The show, and this painting, is now hanging up at Morning Glory Cafe! This post was originally published in The Journal of Wild Mushrooming, and is modified slightly for this format. Any avid mushroom hunter will likely have seen them, reaching blackly (and vaguely ominously) upward from twisted, rotting wood on the forest floor. Maybe you’ve ignored them—‘there’s no way that can be edible’, you might have said to yourself—or maybe you’ve pulled a few from the log they were growing on for closer examination later, noting their reluctance to separate from the decaying but surprisingly hard wood. They might have been hard, brittle, black, like charred twigs, or maybe they were a little cartilaginous, black below, but with pale, powdery tips, releasing a small puff of white, dusty spores to the air as you pulled them from their wooden home. 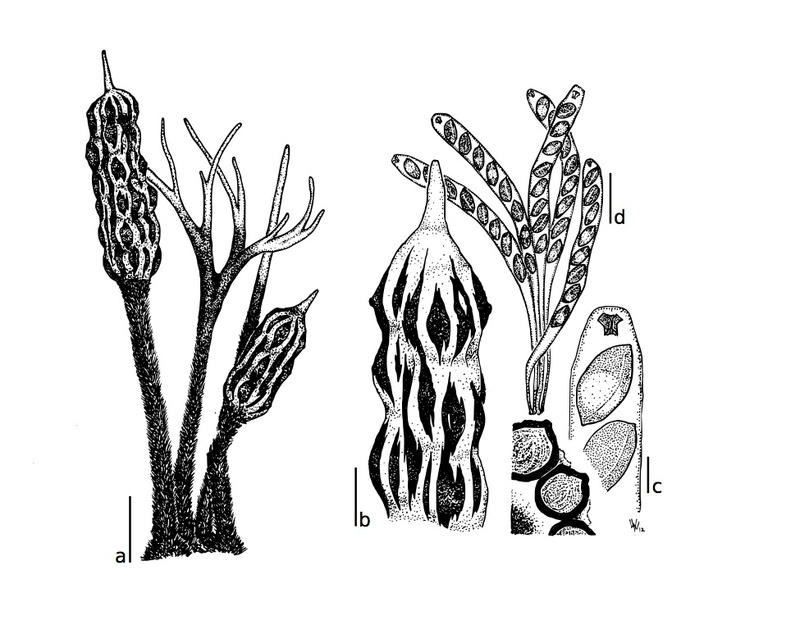 Arora’s Mushrooms Demystified takes you to Xylaria hypoxylon (Fig. 1), the candlesnuff fungus (“much too tough to be of value”), or maybe Xylaria polymorpha, with the morbid sounding common name of dead man’s fingers (“much too tough and rough to be edible”). The notes here hint at a hidden diversity, but the descriptions in this and similar mushrooming guides leaves the reader wondering, holding a small, black fruiting body, with a name that may or may not be correct, and more questions than answers. Xylaria hypoxylon, photo by Alan Rockefeller (MO 225661). This is a young fruiting body: note the pale surface at the upper end (from which it gets the name candlesnuff fungus) and the flattened branching tips, characteristic of this species and close relatives. Perithecia have not developed yet, but will swell from beneath the outer white coating, which will eventually slough off, leaving the black carbonized layer exposed.